The problem with Earthshock is that it should have been just a one-off. Unfortunately, it became the repetitive template for more of the same and swung Doctor Who off in a direction that I think did a lot of harm to the series post 1983. From now until the end of the classic series we’ll see various seasons littered with the dead and nearly dead bodies of continuity obsessed, plot holed ‘blockbuster’ high adventures that are often ill-fitting and uncomfortable within the Doctor Who format (Warriors Of The Deep, Resurrection Of The Daleks, Attack Of The Cybermen and Silver Nemesis are the big casualties whilst Caves Of Androzani and Revelation Of The Daleks are more or less saved by good scripts, excellent casts and by a brilliant director on both). To me it was obvious that Saward took a big gamble with Earthshock, it really paid off and then he spent most of Season 20 very slowly turning the ship of state that was Who onto a course that would allow him to zerox the Earthshock template for the following year. His vision for the series slowly evolves into one that is populated by violent gun-runners, mercenaries, traitors, big bads and their victims. Not many of his protagonists are that fully developed (Lytton comes close but then he’s just a riff on Philip Martin’s John Kline character from Gangsters and he also tries to emulate the Bob Holmes doubleact motif in later stories with some success in, for example, Stotz and Krelper, Orcini and Bostock) and the victims (Kyle, Styles, Stein, Stratton, Bates etc) are often ciphers. 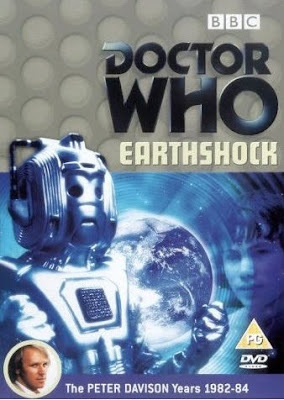 Earthshock as a one-off shows that the series can do anything within the spread of a season and the fact that it sits in a season of think pieces and historical stories and is waywardly different in tone is to the series credit. However, as a pattern cutter for much of what Saward would do from now on it’s formulaic and padded and is not a template on which to sustain the fortunes of the world’s longest running SF series. 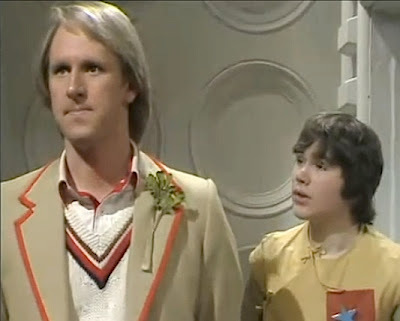 Conversely just as the Fifth Doctor gets a much talked about and admired watershed space adventure with returning enemies Saward also plants the seeds for the mixed fortunes of future seasons. So what did we get back in 1982? Director Peter Grimwade pulling the stops out, chucking them on the floor and stamping on them in order to inject the whole thing with such drive. The editing might seem a tad slow to us now but back then it was fast – lots of short scenes all intercut rapidly MTV style made everyone sit up and take notice. That first episode is beautifully moody as the Doctor and companions explore the caves whilst Scott and his troopers home in on the malevolent androids. Just sit back and watch Grimwade deal with all the elements, marvel at the atmospheric lighting, and the superb score from Malcolm Clarke which seems more like a truly 1960s Radiophonic experience that insists on using weird noises and effects. 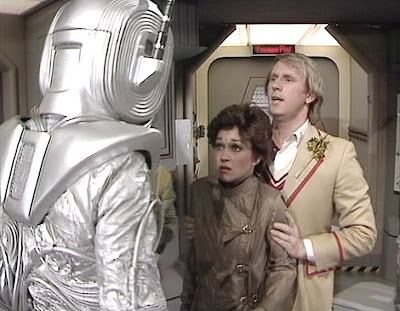 It’s a pity that the first episode is hamstrung by the now typical ‘argument in the TARDIS’ scenes between Tegan, the Doctor and Adric, leaving poor ol’ Nyssa playing devil’s advocate again. 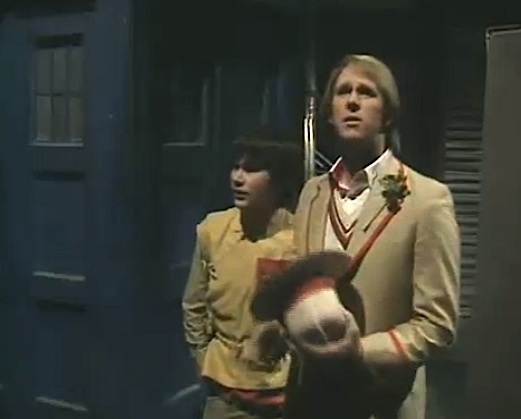 There’s a weird frisson between the Doctor and Adric. A bit of daddy/son bonding that goes beyond the paternalistic, suggests an Adric slightly uncomfortable with a youthful Doctor and a TARDIS full of equally youthful women and is miles away from the Adric relationship with the Baker Doctor in Season 18. Much of this is rather crudely handled foreshadowing, really. A little tiff that underlines the love the characters do have for each other is just to ensure that the death of Adric hits home emotionally both with the characters and the audience. Pity, the audience had already disinvested from the character by now, finding him annoying and unappealing, and it’s just too late to start re-investing characters with qualities they never really had time to explore in the first place. Matthew Waterhouse at least got a memorable exit from a series that really didn't love Adric very much. The denouement of Earthshock was a shocking twist that worked then but looking at it now it just has a slight whiff of crude exploitation about it. Davison is again utterly marvelous here. He’s got a handle on the Doctor and is starting to push against the envelope to see how far he can take it. The vulnerability is certainly tested in Earthshock on many counts and then he adds in a sense of desperation, tenacity and that charming reluctance to get involved that was Davison’s hallmark of a Doctor who wanted to do nice things like play cricket, have tea and cake but inevitably ended up shouting at Adric and facing up to Cybermen. And rarely had we seen a Doctor so out of his depth by the climax of Part Four. The sheer thrill of that first episode’s cliffhanger is what stays in the mind. The camera pulls back and the Cybermen are revealed. I’m sure many fans leaped into the air at that point. A brilliantly handled 25 mins brought to a show-stopping conclusion. By episode two we’re back in Nathan-Turner land. 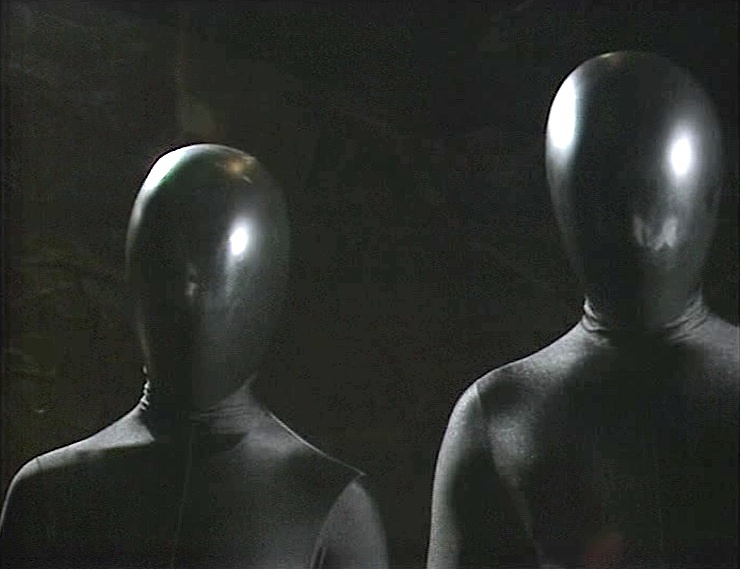 He’s revisited the use of flashbacks – the Cyberscope images of the previous Doctors – and the casting certainly raised an eyebrow at the time. Beryl Reid as the Captain was an odd choice. She does rather come across as your aged Aunt Margaret wearing a leather jacket. It doesn’t really work apart from the ‘camp’ spectacle it invokes and perhaps that was JNT’s motivation. She does her best but she’s too mumsy to really be able to stand up to Cybermen. If Earthshock is itself a foreshadowing of James Cameron’s Aliens then where does casting Reid come from in such a tough as nails blockbuster as this? She can talk the talk but she can’t walk the walk. It's a classic example of Nathan-Turner using his light entertainment clout to secure recognisable names for the series in order to shoehorn them into atypical roles. She's there as celebrity value only. At the time this was lauded as a real return to form after the bold experimentation of Season 18 but if you examine it closely you'll find there's barely a plot and lots of plot holes and oddities. Cybermen gossiping amongst themselves rather too much; a Cyberleader, well played by David Banks, displaying a nasty streak of cruelty and revenge; a Cyberbomb planted in some caves on Earth apparently in secret and yet the Cybermen hijack a freighter and fly it into the Earth and then cause power drains that actually threaten to prevent it reaching its destination. Some strange non sequiturs and a lot of padding. Scott and his troopers are Saward’s ‘cannon fodder’ and James Warwick is rather too earnest to be believable. His delivery of some lines is often hilarious because he’s trying too hard to be tough ('it...could be rough') and is just ending up looking like an estate agent packing guns in space. The script doesn’t give him much room to do anything else and it’s a relief that Davison and to an extent Fielding, Sutton and Waterhouse keep the thing on track with the same ensemble playing that was such a standout in Black Orchid. 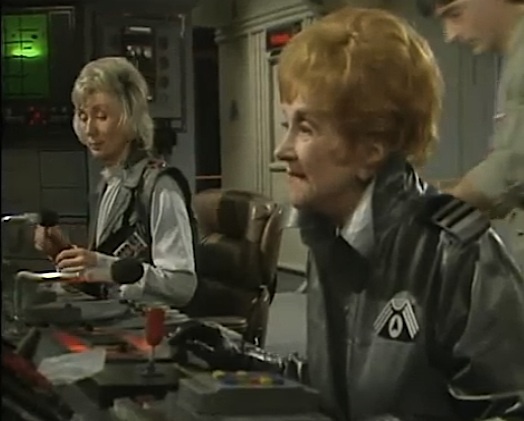 Tegan is so ineptly brave in this and Fielding makes her bumbling quite empathetic. Sutton doesn’t get much to do again, her best moments are in episode one and after that she’s confined, in a typical move that clearly shows up that there were too many companions to write for in the series, to the TARDIS with Kyle? Why is Kyle there? She does not have any function beyond the first episode and with it being hard to write for a Doctor and three companions it just seems ludicrous that she’s still around cramping Nyssa's style. 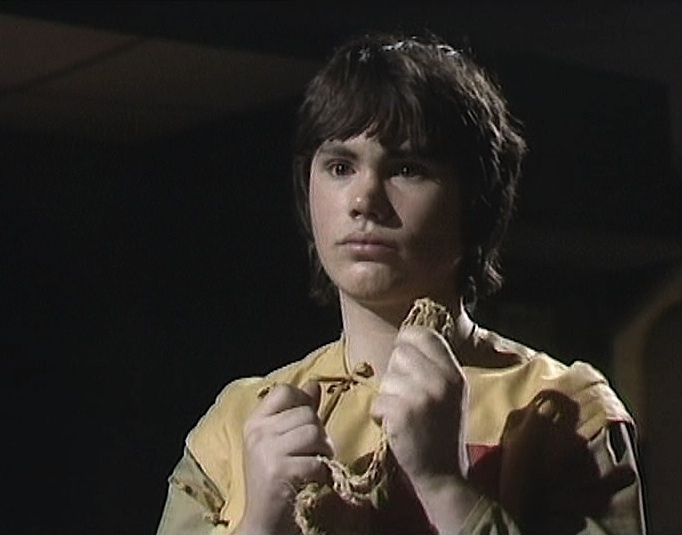 Waterhouse puts in a good little performance here, showing how Adric can work as a companion with the Doctor, man to man as it were. The TARDIS is so full that the regulars have struggled to provide the audience identification that’s needed so desperately at this point. It was inevitable that Saward would want to chop someone down and show that all this running around in space and time can have consequences. Adric’s death is tragic. Tragic in that it is pointless and manipulative. The character's demise is slightly hampered by Waterhouse's obvious reluctance to get his hands burnt by the pyrotechnics that blow up the keyboard. The other characters reactions are handled well apart from the TARDIS scenes where Fielding is ineptly trying to clout Cybermen and Davison is feverishly rubbing Adric’s star for excellence! Like the gold clogging the Cybermen’s chest plates, all the business with the Cybermen firing guns in the TARDIS, blowing up the console, the Doctor shooting the Cyberleader (who is positively savouring the death of a companion) all tend to be a series of dramatic escalations that slightly over-egg Saward's pudding. Earthshock is a rollickingly good adventure, if rather empty and illogical at times, and Grimwade’s care and attention does show in the way the narrative is propelled so fast that you have’t got time to fall into the plot holes and in his determination to drive the story visually and in his editing. The make-over of the Cybermen is fine, particularly the hint of something organic beneath the mask, and the battle sequences are well handled, some of the best in the series so far, as are the production design and visual effects. The sets for the caves and the hold of the freighter are terrific. 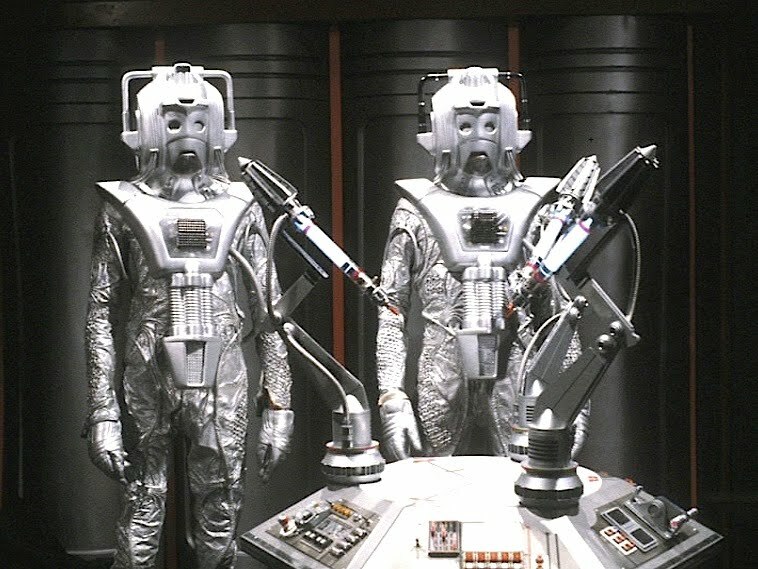 The stand out moment – of the Doctor seeing the Cybermen on the monitor screen – is a synthesis of performance and directing that could not be bettered. 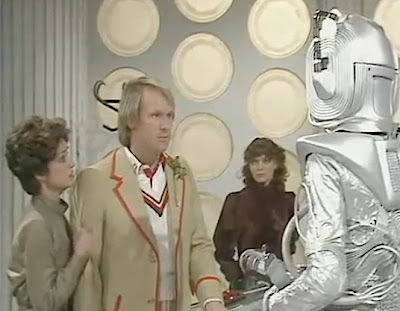 Even Graeme Harper's own Rise Of The Cybermen climactic reveal of the marching Cybermen owes much of its power to this scene. It was enormously popular at the time and rightly so. It’s adventure with a big A, a pastiche of the summer blockbusters that had dominated cinema screens since 1977, but it lacks the depth and subtlety of say Castrovalva or even Saward’s own The Visitation. From here, repetition and an over abundant dependency on the programme’s past move into top gear and the innate charm of the series is too often overshadowed by a smug self-awareness. As usual the Restoration Team work their magic and spruce up the picture and sound and also offer us new CGI effects to replace the 1982 vintage effects. The DVD also offers a number of features. Commentary - cast members Davison, Fielding, Sutton and Waterhouse offer another amusing commentary with the first two slipping back into their amusing piss take of what they are watching whilst Sutton throws in slightly more respectful comments. Waterhouse tends to spend more time repeating lines. Putting The Shock Into Earthshock - Brief documentary that looks at the making of the story, contemporary fan reaction including comments from Saward and the late Peter Grimwade. Did You See? - A nice archive treat as a 1982 edition of BBC2's review programme celebrates the return of the Cybermen to the series. Film sequences - A collection of restored film material from Part One offering alternate cuts that didn't make it into the finished episode. Isolated Score - Malcolm Clarke's rather splendid score on a separate audio track. Photo Gallery - a good collection of black and white and colour stills. Production Subtitles - another text commentary packed with trivia. Oh Earthshock! Except, pretty much nothing in the story actually is a shock. The dialogue is full of hints: arguing in the TARDIS/regretful Doctor staring at Adric's badge; spooky, mysterious androids/Cybermen; talk about the disappearance of the dinosaurs/the ship travelling back thousands of years to crash into Earth. Even the bloomin' title is a hint to the end!